As we know, Jaakko Finne, the editor of the original version of Piæ Cantiones, made some substantial changes to the texts of the carols, replacing any reference to the Virgin Mary with the name of "Jesus," with results ranging from the unusual to the absurd. Woodward, following the lead of others such as Klemming and Dreves & Blume, has restored them to their original form. For this reason, some of the “Christmas Carols” in the original 1582 edition are not Christmas Carols in Woodward's restoration and others. Following the main listing from Woodward will be a listing of all carols from original with notes to their location in Woodward's restoration. Some Latin carols were translated by Woodward for inclusion in The Cowley Carol Book; see: Table Of Contents. My source was a scanned version of the 1910 volume from IMSLP - Petrucci Music Library, Woodward-Piæ Cantiones. This page also includes a partial scan of the 1582 original. Christmas carols in the 1582 Piæ Cantiones as found in Woodward's 1910 restoration. Original PC Christmas, but not Woodward. Guido Maria Dreves and Clemens Blume, eds., Analecta Hymnica Medii Aevi, Vol. 1. Cantiones Bohemicae. (Leipzig: O. R. Reisland, 1886). The entire set is available at Princeton University; an account is required. Some of the songs are available at the CPDL (Choral Public Domain Library), Piæ Cantiones ( http://www2.cpdl.org/wiki/index.php/Piæ_Cantiones; accessed July 4, 2014). At this time (July 3, 2014), there is no copy at either the Internet Archive or Google Books. A facsimile is available at Facsimiles Piæ Cantiones, including scans of individual pages from Piæ Cantiones (in the Adobe PDF format) (http://www.spielleut.de/facs_piæ_cantiones.htm; accessed June 15, 2009). A new edition by tenor and early music specialist Mats Lillhannus, based on the 1582 edition, is freely available at his Piæ Cantiones site. It includes both the music and the lyrics. He also includes Piæ Cantiones 1625 additions. There is also an edition by Timo Mākinen, Die Aus frühen böhmischen Quellen überlieferten Piae Cantiones-Melodien (1964). He is also the author of Piae Cantiones-sävelmien lähdetutkimuksia (1968). I have not had the opportunity to review either volume. There is also Heikki Klemetti, ed., Piae Cantiones (Breitkopf & Härtel, 1911). Finally, there is a Wikipedia article, Piæ Cantiones (http://en.wikipedia.org/wiki/Piæ_Cantiones; accessed July 4, 2014). List of Some of the Principal Works to which Reference is Made in the Explanatory Notes. In his texts, Rev. Woodward will occasionally make a reference such as “Klemming II.” In his Piae Cantiones, Rev. 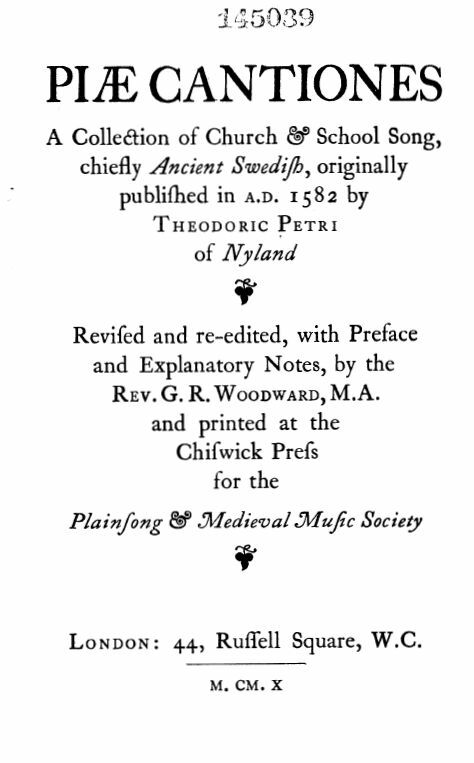 Woodward created this list of principal works to which he referred (pages 267-269). I have slightly amended the format of the references, in some cases, to conform to the MLA standard. I do not speak German, and my French, Koine Greek and Latin have eroded over the years to the extent that I don't consider that I have a working knowledge of those languages either. Works in those languages may or may not be changed from the form given by Rev. Woodward. Note that Rev. Woodward favored the archaic form of the letter “s” that closely resembles the letter “f” , which has led to confusion in retyping some of these texts. Bäumker, Wilhelm. See K. S. Meister. Das katholische deutsche Kirchenleid, etc., Freiberg. 1862-1891. 3 Vols. Words and Music. Note that Meister was the author of the first volume. Subsequent volumes were edited by Bäumker. Böhme, Franz Magnus, Altdeutsches Leiderbuvh. Volkslieder der Deutschen nach Wort and Weise aus dem 12 bis zum 17 Jahrhundert. Leipzig. 1877. Words and music. Breitkopf and Haertel. Denkmäler deutscher Tonkunst. Erste u. Zweite Folge. Leipzi. Many Volumes. Music and often the words also. Chevalier, Ulysse, Repertorium Hymnologicum. Three Volumes. (Louvain, 1892-1904). First lines of hymns , with references. Daniel, Herman Adalbert, Thesaurus Hymnologicus. Hallis. MDCCCXLI-MDCCCLVI. 5 Volumes. Words Only. Dreves, Guido Maria, and Blume, Clemens. Analecta Hymnica Medii Ævi. 50 Volumes. 1886-1907. See especially Vol. 1, Cantiones Bohemicæ, and Vol 45b [XLVb], Cantiones Svecicæ, pp. 131-179. Words, with Tunes occasionally. Du Méril, Édélestand, Poésies populaires latines du moyen âge. Paris 1847. Julian, John, A Dictionary of Hymnology. Revised Edition with New Supplement. (London: Murray 1907). The original edition was issued in 1892. In the 1950s, Dover republished the 1907 Revised Edition in Two Volumes. ii. Joseph Kehrein, Katholische Kirchenlieder, Hymnen, Psalmen aus den ältesten deutschen gedruckten Gesant-und Gebetbuchern. 4 Bde. Wurzburg. 1859-1865. Klemming, Gustaf Edvard. Klemming was a source for many subsequent Latin works, including Dreves and Blume. "Klemming II" is the source for most of the Piæ Cantiones texts. Klemming, and most authors after him, corrected the "editing" done to the original work. 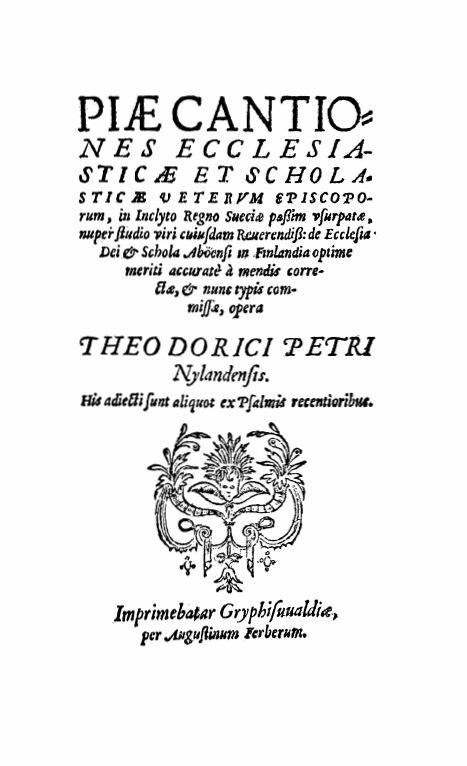 i. Gustaf Edvard Klemming, ed., Hymni, Sequentiæ et Piæ Cantiones in Regno Sueciæ olim usitatæ. 1885. No music. Klemming I.
ii. Gustaf Edvard Klemming, ed., Piæ Cantiones. S. Trinitatas; Jesus Christus; S. Spiritus; S. Maria. Holmiæ. 1886. No music. Klemming II. iii. Gustaf Edvard Klemming, ed., Piæ Cantiones in Regno Succiæ olim usitatæ. Sancti Exteri. Collectionum nostri æui Supplementum e fontibus Sveticis depromptum. 1887. No Music. Klemming III. iv. Gustaf Edvard Klemming, ed., Latinska Sånger från Sveriges medeltid. Cantiones morales, scholasticæ, historicæ in Regno Sueciæ olim usitatæ. Holmiæ. 1887. No music. Klemming IV. Meister, Karl Severin, Das katholische deutsche Kirchenlied in seinen Singweisen von den frühesten Zeiten bis gegen Ende des siebzehnten Jahrhunderts. Erster Band. Freiburg im Breisgau. Herder. 1862. Zweiter Band begonnen von K. S. Meister, und bearbeitet von Wilhelm Bäumker. Freiburg. 1883. Dritter (Schlusz = ) Band. W. Bäumker. Ibid. 1891. Words and music. Mone, Franz Joseph, Lateinische Hymen des Mittelalteers, aus Handschriften herausgegeben und erklärt, etc. 3 Bde. Freiburg im Breisgau. 1853-55. No Music. i. John Mason Neale, ed., Hymni Ecclesiæ, à Breviarijs quibusdam et Missalibus ... desumpti. London. 1851. No Music. ii. John Mason Neale, ed., Medieval Hymns and Sequences. London. 1851. Second Edition, with very numerous additions and alterations. 1863. John Mason Neale and Thomas Helmore, eds., Carols for Christmas-tide (London: Novello, 1853). Set to ancient melodies by Thomas Helmore; the words by John Mason Neale. John Mason Neale and Thomas Helmore, eds., Carols for Easter-tide (London: Novello, 1854). Set to ancient melodies by Thomas Helmore; the worrds, principally in imitation of the original, by John Mason Neale. Norlind, Tobias, Svensk musik historia. Helsingborg. 1901. No music. Praetorius, Michael, Musæ Sioniæ, I-VII. Published either at Regenspurg, Jehna, Helmstadt, Hamburg (? ), Noriberg, or Wolffenbuttel, between the years 1605-10. See Zahn, VI, p. 106, etc. Words and music. Rhezelio, Haquino Lavrenth A., i.e., Haakon Laurencesen of Rhezel. Någre Psalmer | Andelige Wijsor och Lofsonger | vthsatte af Lavrentio Jonae Gestritio. Past. Hernösand. Och nu med Noter affsatte | och aff Trycket vthgångne affHazuino Lavrenth A. Rhezelio Predikant I Gråmuncka Clóster . . . Tryckt I Stockholm. 1619. George Ratcliffe Woodward, Songs of Syon. Third Edition, revised and enlarged. 1910. London. Schott and Co. Words and music. George Ratcliffe Woodward, The Cowley Carol Book. London. Mowbray. 1902. Words and music. Wackernagel, Carl Eduard Philipp. Das deutsche Kirchenlied von der ältesten Zeit bis zu Anfang des XVII Jahrhunderts, etc. 5 Bde. Leipzig. 1862-1877. Text Only. Winterfield, Carl Von, Der Evangelische Kirchengesang und sein Verhältnis zur Kunst des Tonsatzes. 3 Th. Leipzig. 1843-47. Words and Music. Zahn, Johannes, Die Melodien der deutschen evangelischen Kirchenlieder, aus den Quellen geschöpft und mitgeteilt von J. Zahn. 6 Bde. Gütersloh. 1889-93. First stanzas, first lines of words; and melodies, with many variations, occasionally harmonized. Source: George R. Woodward, M.A., Piæ Cantiones. (London: Plainsong & Medieval Music Society, 1910), pp. 267-9. “List of Some of the Principal Works to Which Reference Is Made in the Foregoing Explanatory Notes.” Most of these are available at Google Books or the Internet Archive, or both. These sites are frequently updated.